A Soviet division captured Petsamo immediately at the start of the war. From there, a new division continued the offensive towards its first goal, Nautsi. Finnish forces were able to efficiently delay the enemy, which did not reach Nautsi until shortly before the end of the war in March. During the additional refresher training of autumn 1939, the Petsamo Training Centre, which was subordinate to the North Finland Group, received reservists from the northernmost parts of Lapland. The training centre’s cadre came from the 4th Company (4th/LBG) of the Lapland Border Guard. The training centre’s personnel strength was over 700 men. The training centre established two separate companies (10th SepCo and 11th SepCo) and a separate battery (5th SepBtry). The wartime mission of the under-strength battalion of troops in the Petsamo area was to stop the enemy from advancing beyond Yläluostari (Luostari). It their war plans, the Finnish forces prepared to abandon the villages in the area of Petsamovuono (Pechenga Gulf). The army (14th A) that operated under the Leningrad Military District on the Kola Peninsula included two rifle divisions (14th RD and 52nd RD) and one mountain division (104th MountD). The army’s mission was to prevent the Western Allies from landing in the Kola Peninsula, invade Petsamo and prevent attacks from Norwegian territory. The plan was to use the mountain division (104th MountD) to capture Petsamo and protect it from attacks from the sea, while one rifle division (52nd RD) was reserved for an offensive from Petsamo to Nautsi. The other rifle division of the 14th Army (14th A) was deployed on the Kola Peninsula to prevent a landing. Soviet forces attacked across the border on the morning of 30 November both in the Kalastajasaarento (Rybachy) Peninsula and the Petsamo area. The chief of the Petsamo Training Centre, Jaeger Officer, Captain Valdemar Salmelo, ordered his troops to destroy the harbour equipment and vessels, burn down the villages in Petsamovuono and retreat to positions further back in the Yläluostari area. They were only partially successful in the destruction. However, the enemy division advanced slowly and Salmelo assessed that he had acted rashly. He died on 1 December 1939. Captain Antti Pennanen was assigned to command the troops in the Petsamo area. In the Yläluostari area, Finnish forces halted the resumed offensive by the Soviet division (104th MountD) with a counteroffensive on 3 December. Afterwards, the troops broke away from their positions and withdrew to the next delay positions in Maajärvi. There, Captain Pennanen formed a detachment from his troops that comprised three companies (Detachment Pennanen). The 3rd Company (3rd Co) in the detachment was a unit that was not included in the wartime mobilisation plans. The Lapland Group reinforced Detachment Pennanen with a reconnaissance unit (11th RU) on 8 December. 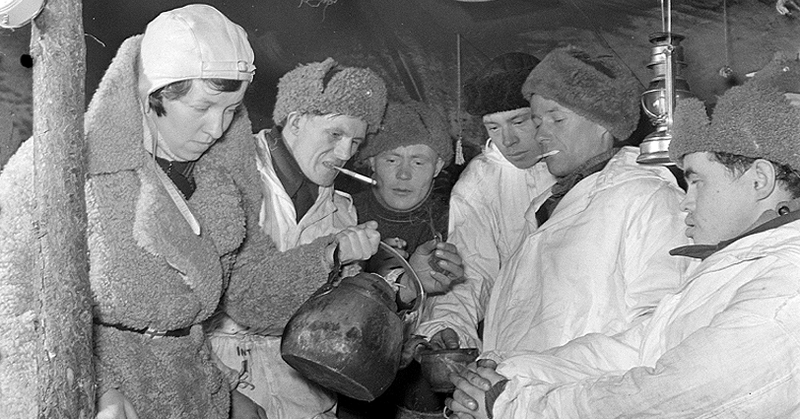 A Lotta serving coffee to soldiers of the Petsamo area who have come to rest at a tent in Höyhenjärvi on 17 February 1940. SA-kuva. An enemy rifle division (52nd RD) was transported to Petsamo in its entirety by sea by mid-December. The division’s vanguard had launched its offensive a few days earlier. In the small hours of 15 December, Detachment Pennanen was forced to abandon the Salmijärvi (Salmiyarvi) area. In terms of its population, Salmijärvi was the largest village in the Petsamo area. On 18 December, the Finnish forces withdrew to the Kornettijoki River, where Detachment Pennanen’s holding battle phase ended. The detachment launched a counteroffensive to Höyhenjärvi on 25 and 26 December. 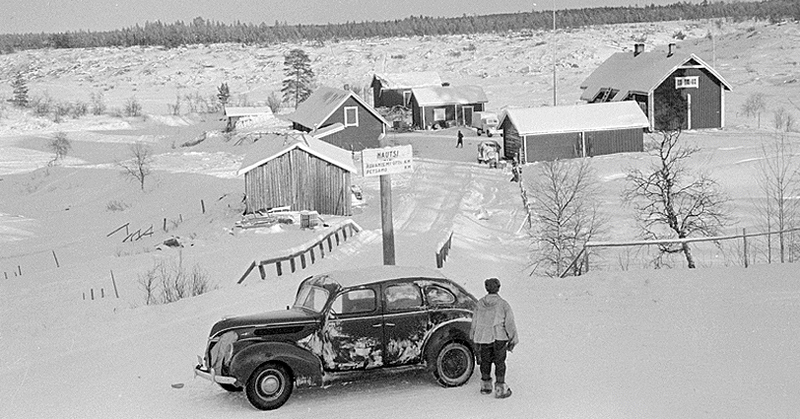 Nautsi 18 February 1940. This small village was still held by Finnish forces at the time. SA-kuva. The enemy division (52nd RD) launched a new offensive at the end of February. The Finnish forces withdrew from the Kornettijoki River to Nautsi on 27 February. On 7 March, Soviet forces relaunched their offensive and captured Nautsi. Detachment Pennanen withdrew to Kohiseva. After this, military operations in the Petsamo area settled down until the end of the war.